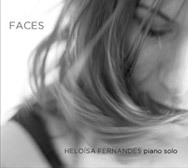 Before Heloísa Fernandes sat down at the Fazioli for her rehearsal, neither she nor the instrument's owner, Thomas Zoells, understood the sound she could evoke from the instrument. The piano lives on the stage of an intimate recital hall equipped with recording equipment housed inside of Piano Forte, a piano store in a renovated three-story building in the South Loop of Chicago. As Fernandes explored, Zoells and Fernandes's manager listened. It wasn't long before Zoells whispered, “She gets the piano.” He had heard many people play the Fazioli and knew the difference between those who understood what was possible and those who didn't. As the rehearsal and then the evening's performance progressed, it became clear that she was finding music that few, if any, had found before. Over dinner after the performance, conversation made clear that Fernandes and this piano should meet again. Zoells offered her the opportunity to record, marking the birth of the album that would become Faces. In the liner notes for the album, Zoells recounts the experience of hearing her perform.